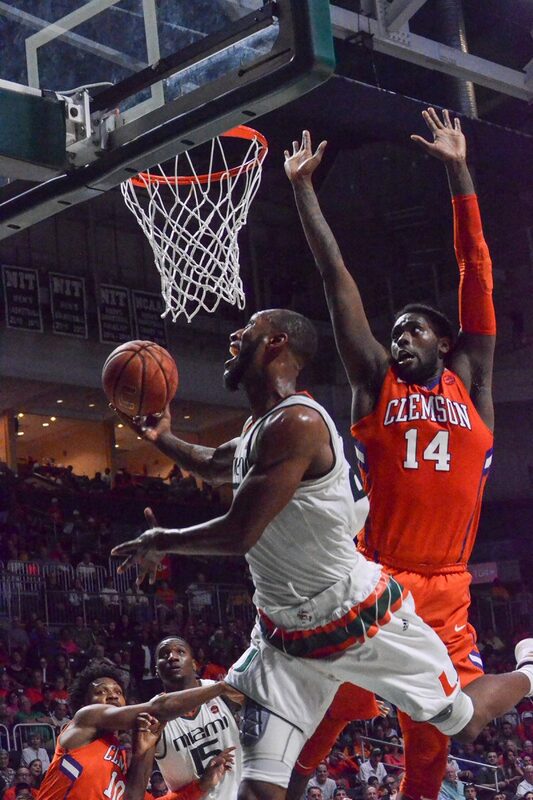 The Hurricanes know what fellow senior Davon Reed will bring regularly, and Mr. Dependable, as Coach Jim Larrañaga now refers to him, brought his usual steady hand with 14 points, seven rebounds and five assists in Miami’s 71-65 win over the Clemson Tigers Saturday afternoon in the Watsco Center. After Kamari Murphy’s career-high scoring effort, he had a message for the rest of the ACC. “Teams gotta change their scouting now,” said the senior captain. Murphy hit four mid-range jumpers on his way to a career-high 15 points. Despite the impressive offensive showing, he knows what he is expected to bring night in and night out. “I’m still rebounding, still playing defense. I just happened to hit a couple shots today,” he said. 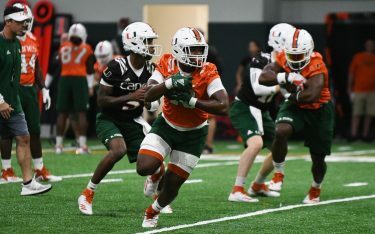 If not Murphy’s jump shot, what might be a new wrinkle of the offense that opposing coaches have to account for is the number of playmakers springing forth all the way down the roster. With junior guard Ja’Quan Newton serving the second game of his three-game suspension, Larrañaga needed everyone to create a bit more. Miami (18-8, 8-6 ACC) responded with 19 assists to just seven turnovers. “We shared the ball extremely well, and we’re getting assists from multiple players now,” Larrañaga said. Leading the way with five dimes apiece were Reed, freshman guard Bruce Brown and sophomore guard Anthony Lawrence, who provided the highlight of the first half with a beautiful behind-the-head dish to a rolling Dewan Huell. Larrañaga has continually stressed how much the coaching staff works with the team’s young big men, and that work is beginning to show itself on the court. Sophomore center Ebuka Izundu scored inside with ease early in the contest on his way to 11 first-half points. While he didn’t have a big night on the scoreboard, Larrañaga praised the defensive efforts of Huell, particularly when he was forced to switch onto Clemson’s star player Jaron Blossomgame. The score was close the entire way with neither team leading by more than eight points. Murphy’s eight second-half points were instrumental in staving off the feisty Tigers. He also grabbed a team-high nine rebounds. 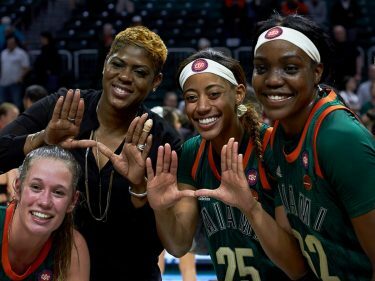 Brown provided the dagger, knocking down a three-pointer to give Miami a six-point lead with just around 90 seconds to go to put the finishing touches on the win. It’s a tough loss for Clemson (14-12, 4-10 ACC), who were led by senior Blossomgame. He scored a game-high 16 points – overcoming a rough start, shooting 1–6 – and pulled down eight boards. Larrañaga called him an NBA-quality player after the game. Clemson big man Elijah Thomas did his part with a double-double, but it wasn’t enough in the end. It’s the seventh conference loss for Clemson by two or fewer possessions, and its performance in close games might cost the team an NCAA Tournament bid. “It’s not for me to say – I don’t think [the loss]does much [for our chances],” Tigers Coach Brad Brownell said. Regardless, Clemson is running out of time to pick up resume-boosting wins. Murphy acknowledged that the squad has its eye on playing postseason basketball, and the upcoming stretch will test how ready it is for that. 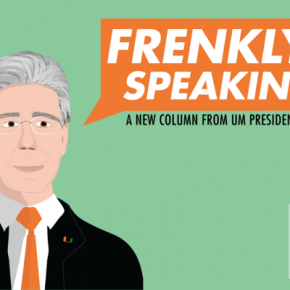 UM travels to No. 18 Virginia on Monday before hosting No. 10 Duke next weekend in a brutal stretch. While it won’t be easy, if the Hurricanes continue to jell well, the team knows it has a shot against anybody.